Chrissie's Shell is a thought-provoking, whimisical story about a turtle who is looking for a way to fill her empty shell. Chrissie believes her shell is empty and spends the day wandering thru the forest wishing she was as amazing as the other creatures she happens upon. She's not as fast as mouse, nor can she climb as high as a squirrel and imagines herself in each of these roles, believing that if she could do any of these things, then maybe her shell wouldn't be empty. Chrissie doesn't realize, as she journeys along, that the things she does are just as amazing. At the end of her travels, she asks God why her shell was empty and couldn't she please have it filled with one of the other critters that she met. God tells Chrissie that he has already filled the shell with the most amazing thing that God could think of and that was Chrissie herself. I loved the illustrations in the book, they were drawn in a charming and endearing way, that I'm sure wee folks will find visually enjoyable. The moral of the story, that God made us each as we are and we are all perfect, is a good moral to pass along to our children. God's message is that you don't have to be something you are not...for you are perfect just the way you are~!! 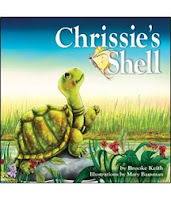 Chrissie is a little turtle with a big problem: she believes her shell is empty. She spends her days comparing herself with other animals in the forest and imagining what it would be like to be them, only to end up disappointed again and again when she finds she cannot transform herself into someone new.